Was your ancestry involved in live stock? The Australian Pastoral Directory lists stockowners in all states of Australia. We've digitised five directories, ranging from 1913 to 1954. The 1913 directory lists approximately 231 pages of stockowners in all states of Australia. There is also a separate index for both New South Wales and Queensland by station, a list of prominent stock agents in four states and various statistics and advertisements. The listings for Victoria, South Australia, Western Australia, Tasmania and the Northern Territory give name and address of the stockowners. 1913 is the only year where just a map of New South Wales is included which shows pastures protection districts. The 1923 directory lists approximately 23,000 stockowners in all states of Australia. There is also a separate index for New South Wales by station, a list of prominent stock agents in four states and various statistics and advertisements. The listings for Victoria give name, address and number of sheep. The listings for South Australia, Western Australia, Tasmania and the Northern Territory give name and address of the stockowners. The 1925 directory lists approximately 24,000 stockowners in all states of Australia. There is also a separate index for New South Wales and Queensland by station, a list of prominent stock agents in four states and various statistics and advertisements. 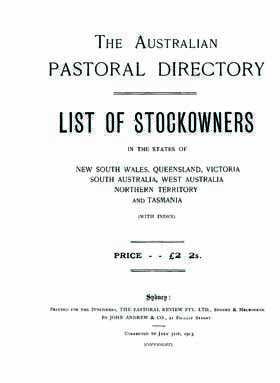 The 1931 directory lists stockowners in all states of Australia in over 400 pages. There is also a separate index for both New South Wales and Queensland by station, a list of prominent stock agents in four states and various statistics and advertisements. In 1954 there were tens of thousands of stockowners throughout Australia. This 600 page volume lists most of them. There are separate indexes for both New South Wales and Queensland by station, as well as lists of prominent stock agents in four states (New South Wales, Queensland, South Australia and Victoria) and various statistics and advertisements. The listings for Victoria, South Australia, Tasmania and the Northern Territory give the name and address of the stockowners.